Seth Wyse has longed to court widow Grace Beiler ever since she arrived in their Pennsylvania community, but his imaginings of their life together are nothing like the reality. When Seth discovers that a clause in Grace’s husband’s will means that she may have to relinquish custody of her autistic son to her harsh brother-in-law, Seth knows he has to help her in any way he can. Grace isn’t so keen on marrying the young, charismatic Seth, but she’ll do anything to keep her son safe. But each of them brings secrets into their marriage of convenience; for Grace, this means the truth about her first marriage and her husband’s brutality, and for Seth, it is his forbidden love of painting. Grace is scared to let herself fall in love with Seth, and Seth knows he needs extra care when it comes approaching his new wife. Together, they must figure out how to forge a life together, and protect Grace’s son, Abel, from his uncle. Having read the second Patch of Heaven novel back in March 2011, it was a long wait for Threads of Grace. I will start out by saying that I didn’t enjoy the third instalment in the series quite as much as the previous two. I’m not sure if this is just because I didn’t connect with Grace quite as well as Sarah and Lilly—the heroines of the previous two novels—or simply because my reading tastes have changed a little. Either way, Threads of Grace was still a very enjoyable read. It felt a bit shorter than Kelly’s previous novels, but in all honesty, this could just be because I gobbled it up in less than twenty-four hours. One of the things I so admired about Kelly’s second novel, Lilly’s Wedding Quilt, was that it was one of the first Amish novels I’d come across that explored some rather edgy or taboo topics. Two years later, I’m pleased to see that more authors are delving into previous unexplored issues (teenage pregnancy in Beth Wiseman’s His Love Endures Forever and infidelity in Kathleen Fuller’s Faithful to Laura are two recent examples). 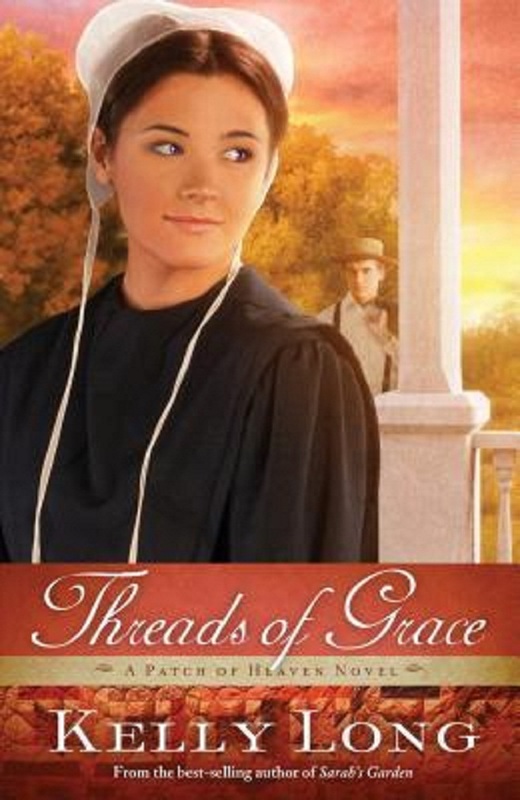 But as with Lilly’s Wedding Quilt, I was pleased to see that Threads of Grace addressed some contemporary issues that are just as relevant to the Amish as they are to us Englishers, and without sounding preachy. Grace’s abusive marriage was dealt with incredibly sensitively, and I found her hesitance in her relationship with Seth rather realistic considering her past experience of marriage. Those who have autistic friends or relatives will be pleased with how Grace’s son, Abel, is depicted, and I know that the descriptions are realistic because Kelly has openly talked about being the mother to autistic children. One thing that I know I can rely on with Kelly’s writing is that she doesn’t sugar-coat the Amish lifestyle, and she depicts her Amish characters as men and women who struggle with very similar issues to those of other faiths and lifestyles. What surprised me most about this novel was that it featured yet another marriage of convenience. As Kelly has shown in Lilly’s Wedding Quilt and her novella in the An Amish Love collection, she’s great at rendering realistic contemporary marriages of convenience, but I didn’t expect to come across two plots a similar vein in the same series. Despite this, I enjoyed reading about Grace and Seth’s gently blossoming love for each other. Although I didn’t connect with Grace as well as I did with Lilly, I appreciated being able to witness her slowly coming to trust Seth. The scenes in which Seth and Abel interacted were particularly heart-warming, but I did wish we’d had more insight into Seth’s struggles and flaws. Although the details about his love of painting and Grace’s dilemma over whether she should allow her husband to teach her son to paint were interesting, his love of painting seemed to be his only major flaw. He seemed just a bit too perfect, especially considering what we knew about his wild past. My biggest gripe with this novel probably has to be the subplot about Grace’s younger sister, Violet. Violet follows Grace out to Pennsylvania when her parents die in an accident, and Seth’s family invites her to live with them. Initially Violet seemed to have a lot of potential, but something about her storyline just fell flat and didn’t resonate with me or grab my interest. At Seth and Grace’s wedding, Violet spots an attractive young Amish man and makes it her mission to make him fall in love with her. She spends the rest of the novel pursuing this young man and convincing him to court her. The storyline never really concludes, so I have to assume that it’ll be picked up again in the next novel, but all in all, it really felt like it was just filler for in between the sections about Seth and Grace. I wish I could say better things about this part of the novel, but I just never found it terribly interesting. Although I felt that certain aspects of this novel could have been improved on to make Threads of Grace a more compelling read, it was still worth the two-year wait. Fans of realistic Amish fiction will be pleased at the way the novel explores the issues of spousal abuse and autism, and Grace and Seth’s sweet romance is sure to warm every romantic’s heart. I hope this is a series that Kelly plans to continue, and will be keeping my eye out for her next offering. Hi, Rachel! For a compulsive reader you have a well-written review. I have not read any of the novels yet but I do understand that when it comes to book appreciation connecting with the character is necessary. However, I will check it out!